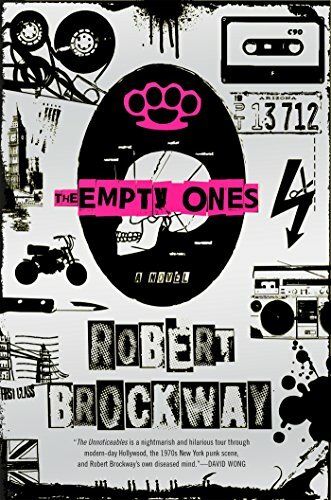 First came The Unnoticeables; now author Robert Brockway has delivered The Empty Ones, book two in the Vicious Circuit series, a raunchy ride of a story drenched with hilarious one-liners, quirky characters and page-turning chaos. Fast forward to 2013, somewhere in the American Southwest. Ex-waitress and B-grade stuntwoman, Kaitlyn, along with her best friend, Jackie, and the bruised, battered and never-short-of-a-witty-comeback Carey, on the run from Marco and his team of freaks. This is the same Marco Luis whom Kaitlyn once thought of as her teen heartthrob. When she realizes she’s not as weak as she first thought, Kaitlyn heads for Mexico along with Jackie and Carey to seek out and destroy Marco and his Unnoticeables. The Empty Ones follows the aforementioned set of misfits as they drink and curse their way through multiple attacks and chase scenes. Constantly badgered by half-people, tar-men, angel-like creatures, and mechanical mutations to name a few, the characters trudge on in the hope of seeking vengeance and rescuing friends. Oh, and maybe saving mankind along the way. The Empty Ones is overflowing with personality. Each character’s narrative is clearly defined and reflective of their individual persona. For example, Carey takes whatever life throws at him: eyes wide open, dodging spit, spiked hair, combat boots and broken bottles. His dialogue is spotless, unlike the carpet around him. Carey is foul-mouthed, filthy, and a gem of a character. Brockway’s brilliant observational skills bring every line to life, similar to a scratch and smell peel-off sticker with an added bonus of The Ramones. His understanding of the language, clothing, and music of the punk era shine through in his authentic writing. A delicious cocktail of dark humor and fantasy-horror, at times The Empty Ones brushes close to the craziness of reality. Recommend reading The Unnoticeables prior to The Empty Ones. Just a note: If you are offended by colorful language (swearing, lots of it) and punk culture then this may not be the book for you.